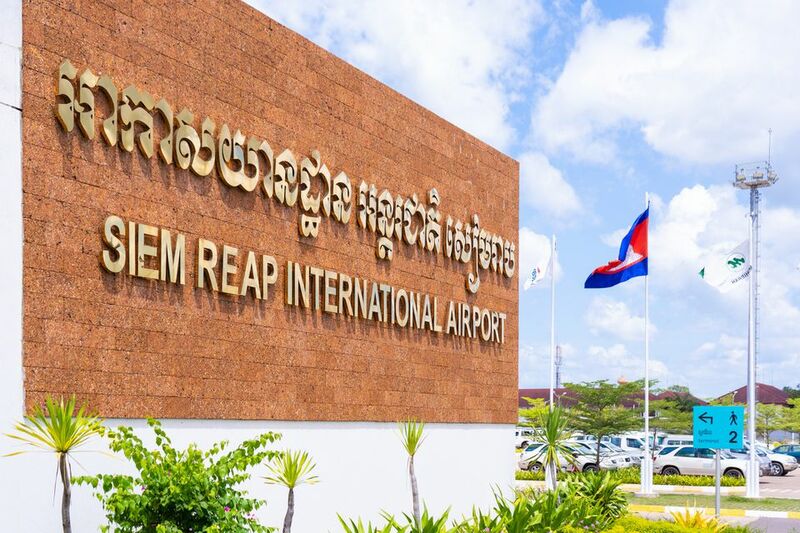 The city of Siem Reap may not be the present capital of Cambodia, but the Siem Reap International Airport (IATA: REP; ICAO: VDSR) does better business than its counterpart at Phnom Penh. About 3.3 million travelers flew into Siem Reap in 2015 compared to 3.1 million to Phnom Penh; those figures represented a growth of 20 percent for Siem Reap over last year's, compared to 15 percent for Phnom Penh. This growth was achieved despite REP's decidedly more humble facilities, whose capabilities have long been outpaced by the meteoric tourist growth into Siem Reap. The government plans to build a replacement airport with two runways and larger terminal buildings at Sot Nikum district, about 23 miles east from Siem Reap proper, but that is many years away at the moment. Siem Reap International Airport is located around four miles northwest from Siem Reap's town center - the distance can be covered in ten minutes by taxi and about twenty minutes by tuk-tuk. The airport serves as a hub for Cambodian carriers Cambodia Angkor Air and Sky Angor Asia Airlines. Low-cost international carriers that fly in and out from Siem Reap include Air Asia, Air China, Cebu Pacific, Malaysia Airlines, SilkAir and Vietnam Airlines; these flights also connect to regional hubs like Changi Airport in Singapore and other airports in Southeast Asia, China, South Korea and Japan. Its 8,366 feet of runway and suite of facilities can handle up to 2.6 million passenger movements and over 900 tons of cargo a year. Its capacity is somewhat limited by its close proximity to the Angkor temples, though - while the runway is built to allow takeoffs at either end, planes are only allowed to take off on the western end, as the eastern zone flies right over Angkor Wat. Cambodia allows visa on arrival (cost: $20) for most foreign tourists entering Siem Reap International Airport (check with your country's Cambodian Embassy for travel requirements specific to your nationality; if your country isn't included, you'll need to secure a visa before flying in). The queue for securing a visa can be slow, particularly during peak season - you may want to consider getting a Cambodia e-visa (cost: $25) that guarantees smooth sailing even before you disembark from your plane. For more, read this article about getting a Cambodia e-visa. After the baggage claim area, you'll first exit into an anteroom with a number of stalls selling prepaid SIM cards for cellphone use. SIMs start at $4, and include both call and data. Read more about prepaid SIMs and cellphone roaming in Southeast Asia. Those are US dollars, which is legal tender in Cambodia. Tuk-tuks and other transport touts are not allowed to queue in the airport; you can arrange to have a tuk-tuk pick you up, or your hotel can send one to pick you up ahead of time. The latter service is often offered free of charge by hotels in Siem Reap. The short ride back to the airport from Siem Reap will set you back $5 if traveling by tuk-tuk. An international departure tax costing $25 is now conveniently tucked into your ticket price, though if you're traveling to another city in Cambodia, you'll still need to pay a $12 domestic departure tax at the airport. Travelers departing Siem Reap can help themselves to the following services and amenities while waiting for their flight air-side. Private lounge: the CIP "Le Salon" Lounge provides premium services to paying passengers; these include internet access, cable TV, food and drinks, all dispensed in a relaxed, private setting. Restaurants: A number of restaurants serve refreshments and complete meals to departing passengers. These include a Dairy Queen kiosk, Deli Paris (baked goods), FCC Bar (alcoholic drinks and hot meals), and the Blue Pumpkin (light refreshments like ice cream, coffee and sandwiches). Duty-free shops: Dufry Cambodia sells the usual duty-free favorites, covering cosmetics, perfumes, wine and more. Gift shops: A plethora of gift shops in the departure hall sell silk items, sandstone sculpture, jewelry, and contemporary clothing. Online: the official site is here: rep.aero. The Cambodia Airports authority has also authored a smartphone app (for both Apple and Android phones) that you can download here: bit.ly/scaapp.